It sounds counterproductive to plan a vacation when you're trying to get more done, but you can't work, work, work all the time. Going on vacation lets you relax for a few days and come home refreshed, ready to tackle your to-do list. 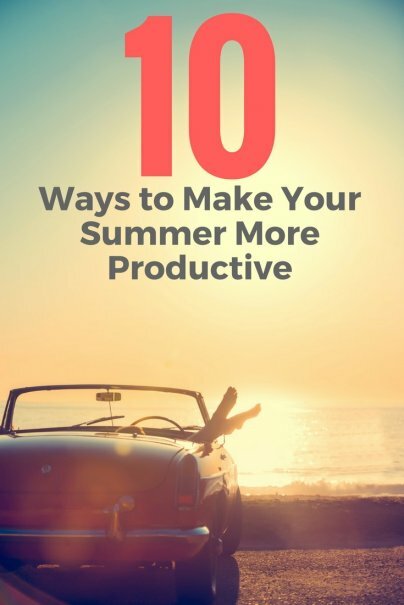 Plus, the lead-up to your vacay often includes packing, cleaning, and tying up loose ends at work, which is sort of forcing you to pay attention to things you may have neglected for a while. Just be sure to finish what you need to finish beforehand. Work hard, reward yourself for your diligence while you're away, and return better than before. When I was in college, some of my professors would have class on the quad to take advantage of the nice weather. It might not sound like much, but it's amazing how creatively you think when you're not stuck in a bland classroom. Of course, you're probably not still in college, but you can apply this logic to your work life. Have walk-and-talk meetings outdoors or plan a meeting during lunchtime at a picnic table. Getting out for a bit will break the day up, and you'll gain more energy after that dose of vitamin D so you can beat the 3 p.m. slump. There's a list for almost everything on my phone — groceries I need to buy, meals I'm making, date night ideas, articles I need to write, restaurants I want to try, etc. I honestly can't function without a list. I don't know how any busy person can. So if you really want to own your summer, start making lists for things you need to buy, places you want to visit, books you want to read, and anything else you'd like to accomplish by Labor Day. When setting productivity goals, be reasonable. If you think a project or task is too much for you to handle, it probably is. In that case, it might be necessary to cut it down into smaller goals to make the process more digestible and ultimately achievable. "Choose one or two reasonably sized projects to work on during the summer," advises Rashelle Isip, professional organizer and author of the lifestyle blog TheOrderExpert.com. "Once you finish those projects, you can take stock and re-evaluate your situation. Did you finish your project? Do you want to work on another project? Do you have enough time to complete another project? Finishing a single project is much more productive than halfheartedly starting three projects and leaving each half-finished." As a multi-business owner, I'm always doing something. That leaves me little time to relax. By combining tasks — particularly an enjoyable task with a mundane one — I'm able to speed things up. For instance, I catch up on my DVR'd shows while I'm folding laundry, respond to emails and read the news while I'm on the treadmill, and I listen to audiobooks while mowing the lawn. Those jobs alone are rather boring, but by pairing them with an activity I like, I seem to get them done faster and without dread. I don't have to present you with a study or new research about how sleep is necessary and good for you. You already know that. So why do we all feel guilty when we get the recommended amount of sleep per night, or even sleep in sometimes? That ends here. Make peace with your need for more shut-eye, and you'll see the results in your energy level almost immediately. Sarah Brown, wellness expert for Mattress Firm, concurs. "When we're trying to be productive, we often think we need to stay up late hours to fit everything in, but it actually decreases our productivity," she explains. "Adults need six to nine hours of sleep each night, depending on the person, to stay productive. Keep a sleep schedule so that your body falls into a routine for sleep. You'll find yourself making better use of the time you are awake." Summertime certainly tempts you to stay up later, but try to manage your sleep so you're getting enough and can also get up fairly early without feeling like a zombie. Your daily commute to work will go smoother once you've had time to sufficiently shake the sleep off and face the day rather than jumping out of bed and rushing around because you may be late. Get up early, get ready at your own pace, enjoy your cup of coffee, and prepare for the day ahead without the frazzle. If there's too much on your to-do list, spread those tasks around. There's no reason you should be taking on the brunt of the chores when you're not the one who even came close to making the brunt of mess. Plus, the kids are on summer vacation. What else do they have to do besides sleep all day and play video games? Make 'em earn their keep with good old-fashioned housework. They'll survive, and maybe they'll learn a few skills along the way. One of my biggest time savers is choosing my outfits and planning my meals for the week ahead. I usually do this on a Sunday evening when I'm at home watching TV. I choose what I'm going to wear for the week, and iron and assemble the outfits on hangers in the closet. This alone makes mornings a breeze because I can get dressed straight from the shower without any decision-making.